The Guardian™ Storage Box is the only long term storage container that is proven to protect your items from fire, water and other environmental damage. 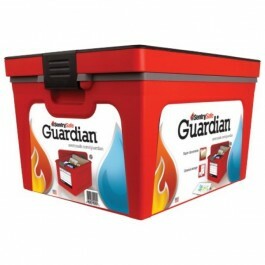 Designed to protect your important business documents, it can hold both letter and legal size paper. Two latches secure lid in place to keep out debris. Units are also stackable to provide a convenient storage solution even when space is limited. Ideal for the small office, retail store, car dealership, attorney or accounting office that is looking for a very affordable way to protect vital documents from fire and water damage.